Please arrive here; and kindly accept sanctifying smoke and offerings. I present sanctifying smoke with turquoise juniper, butter flour, and burnt offerings. I offer prime portions of ambrosial nectar (dütsi), tea, and beer. Please ensure the pacification of enemies, hindrances, and harm. Please ensure the magnetization of the three realms. Please repel the incursion of opposing military forces. Please ensure the expansion of resources and fields of influence. Please decimate harmful enemies into dust. Waver not from your entrusted Awakened Activity! 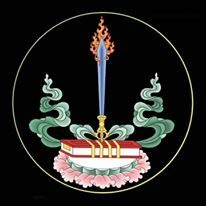 This was composed by Karma Arāga (Karma Ch’agmey, karma a raa ga) for the King of Nangch’en, Rinch’en Namgyel (nang chen rgyal po rin chen rnam rgyal). Translated from the Tibetan by Erick Tsiknopoulos, December 2016, in Boudhanath, Kathmandu, Nepal; and finished in June 2017, in Bucharest, Romania. Special thanks to Ngakpa Chöying Dorjé, who helped with the transliteration of the text from the handwritten Umey (dbu-med) script done from memory by Bhakha Tulku Rinpoché, and to Lee Rostosky, who commissioned this translation at the behest of Bhakha Tulku Rinpoché. 1 Could also be pronounced KYÉ (kye), but the spelling is literally kyai. Both forms are common.